Came across some pigface Carpobrotus edulis - an escapee from South Africa. I have been trying for ages to get a photo of the dragon flies that patrol the paths and elude my camera lense. This one was tangled in a spider's web. 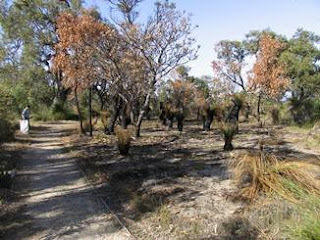 This patch of bushland was burnt on October 3rd - a Friday - school holidays are always a dangerous times for fire.